Officials are putting together a proposal to create a fast-track development zone that would establish two exchanges — for raw diamonds and cut diamond — and an export hub in Khabarovsk and turn the Republic of Sakha into a major diamond production centre. The Russian Far East Development Ministry is developing a plan to transform Khabarovsk — a city of half a million people, 30 kilometres from China's northeastern border — into a new Antwerp for the diamond industry. The ministry has been putting together a proposal to create a fast-track development zone in the Far East that would establish two exchanges — for raw diamonds and cut diamond — and an export hub in Khabarovsk and turn the Republic of Sakha, located to Khabarovsk's north, into a major diamond production centre. 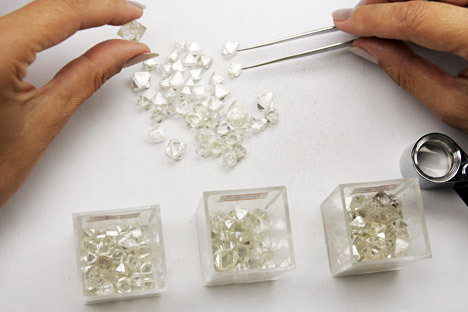 The plan seeks to profit from the geographical proximity of the region, which contains 35 percent of the world's diamonds, to the expanding Asian market, Kommersant reported Tuesday, citing a copy of the proposal. According to Russian diamond cutter Nurba Diamonds, which had a hand in developing the proposals, the plan could generate $2.6 billion annually for the Russian economy. While the U.S. still accounts for the largest share of the $72.1 billion diamond jewellery market, China is the fastest growing, expanding by 8.1 percent last year, followed by India with 6 percent growth, according to research by consultants Bain. The development strategy would create two industrial clusters. One of these — a sorting and laser-cutting centre — would be built in the Republic of Sakha, where the world's top diamond producer Alrosa is based. The other — a final sorting centre and export hub — would be created in Khabarovsk. The Republic of Sakha would also manufacture mining and drilling equipment, diamond products and be home to an artificial diamond-growing facility, according to the plan. The products from this hub would then find their way to the exchanges of Khabarovsk, where a free-trade zone would be established and a free port for diamond storage. The city would contain modern jewellery production centres, while VAT on raw and processed diamonds would be scrapped and the clearing time at customs cut to three hours from the current two weeks, according to the plan. Sergei Goryainov of industry analysts Rough & Polished poured cold water on the development strategy. “Khabarovsk has never been involved in the diamond industry chain, it has no raw materials, no cutting facilities and no consumers. The geographical motivator and the attempt at a comparison with Antwerp do not stand up to any criticism,” he said. The scheme presents the risk of huge expenditure and serious damage to Alrosa's reputation, which sells more than 70 percent of its raw diamonds through long-term contracts and only about 20 percent on the spot market, Goryainov said. Alrosa processes some of its diamonds at its own cutting and polishing facilities and it also uses the services of several cutting plants in Moscow and Smolensk. At a Cabinet meeting dedicated to the development of the Far East's economy on Tuesday, Prime Minister Dmitry Medvedev requested that the Far East Development Ministry submit final plans for the fast-track zone including proposals for special subsidies and land use rules, tax breaks, simplified customs procedures and procedures for hiring foreign specialists by April 30, according to the order published on the government's website.